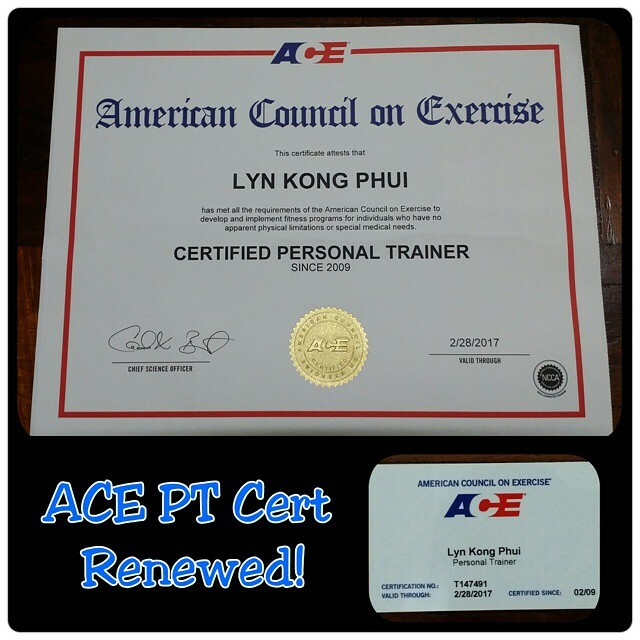 Very happy to have renewed my certification as a Personal Trainer! This certification is awarded by the American Council of Exercise (ACE), USA. I have been a certified since 2009 and will continue to pursue education and upgrade my knowledge. This year, 2015, I plan to recertify in my CrossFit Level 1 Cert, and obtain my Level 2 Trainer Certification as well. I believe that learning is the best way to share knowledge and help the people around me. My clients have benefited from my sessions and I believe I will have MORE to share in future! I would also like to extend my services to aspiring Personal Trainers. If you are looking for advise on how to start your personal training business or even how to start coaching new clients, please do drop me a line [lyn@lynkong.com]. I would be more than happy to be of assistance.